"[Town Stages] was amazing. They set up stages for us in each room in a way that made sense for us. Each sub-team was able to accomplish what we needed and we were also able to gather as a full department, all in one facility It seemed like every time we needed something, the staff on hand response was, no problem, and yes, that was included. Can't wait to come back next year." "Beautiful space run by wonderful people. Their mission is rare and essential in NYC!" "Went to see a show here recently for the Mother Line Story Project and was really blown away by how nice it was." "Run by amazing people who are committed to supportive affordable spaces. The facilities are brand spankin' new and GORGEOUS. They have acoustic and digital pianos, a stage, seating, a bar area, decent sound system with basic capability, and it looks like they're only going to be getting bigger and better. You CANNOT do better in NYC." Including the ABTG NYC donation, Art Beyond the Glass has donated more than $171,000 to arts nonprofits across the country since its inception, made possible by thousands of dollars in in-kind donations, silent auction and raffle items. With its flagship event in June and upcoming events in Oklahoma City and the Bay Area, ABTG is expected to cross the $200,000 fundraising total by the end of the year. Read more. BizBash C.E.O. David Adler: What’s on the Mind of Event Pros? Does the new Haute Dokimazo crowd-sourced think tank conference give us a barometer on top issues? In January, I attended the New York City edition of Haute Dokimazo. Billed as a “think tank” for event pros, Haute Dokimazo, which means “to examine” in ancient Greek, is the brainchild of Liz Lathan, Nicole Osibodu, and Tom Spano. The organization was born from their observation that many of the larger association and industry events were becoming irrelevant in the lives of attendees. So they formed Haute Dokimazo to bring together no more than 100 event pros. Recently, Austin, Texas-based marketing agency C.E.O. Jeff Haynes of Haute Rock Creative acquired the group. Read more. I have created, organized, and attended thousands of corporate events over my career and often felt like the basic meeting model is broken. It's too standardized, frequently focused more on the keynote address and not the overall attendee journey. Creative approaches are repeated, leaving attendees uninspired. I love seeing new ideas, technologies, and approaches to build brand engagement. I was recently invited to attended the "HD" Conference in NYC and it truly was a unique experience. Read more. Two Hands Productions presents Pilots: Season 001 - Far Off Places at Town Stages, 221 West Broadway, NYC running March 6-27, 2019, Wednesday evenings at 7pm. Single show tickets are $25 and include one drink ticket for the bar special of the day. $80 season tickets, which include one drink ticket for each of the four dates, are also available. Early bird season tickets are available for $60 until 11:59pm on February 19th. Read more. In an emotional and sometimes combative second hearing before the New York City Landmarks Preservation Commission, the owner of the iconic Strand Bookstore, Nancy Bass Wyden, continued her effort to keep the famed bookseller’s building from being designated a city landmark along with seven other buildings on Broadway between East 12th and 14th Streets. Read more. I know a few master mixologists not only serving them up, but creating unique craft spirits. Joanna Carpenter is making magic over at Town Stages in New York City (while also fiercely advocating for women in the hospitality industry) and Tom Richter created this handcrafted quinine tonic, Tomr’s, that’s really fantastic! Read more. Town Stages announces the 2019 slate of recipients of the annual Sokoloff Creative Arts Fellowship: Charlotte Arnoux & Alex Parrish, Nikko Benson, Éamon Boylan, Maximus DeFrancesco, Molly Powers Gallagher, Tess Howsam, Rachel Lin, Anna Lublina, Lacy Marie Meyer, Ben Moniz, Marina Montesanti, Zach Morris, Mark Murray, Tara O'Con, Noah Reece, Tidtaya Sinutoke, Alex Spieth, Jeff Tang, Greg Taubman, The Mother Line Story Project, Will Thomason, Isaac L. Thompson Jr, Rebecca Vineyard, and Emma Rosa Went. Town Stages is home to this unique Fellowship Program for artists, entrepreneurs, writers, content creators, movers, shakers, and makers of all kinds. The 2019 Arts Fellows receive access to Sokoloff Arts' executive staff and community of collaborators for development and execution; free workspace to host meetings, develop, write, practice and collaborate; subsidized presentation and performance space; and a cohort of contemporaries to provide support and feedback. Read more. Town Stages presents an industry reading of Billy and the Golden Pencil: A Superhero Musical at Town Stages, 221 West Broadway, NYC on Monday, January 21, 2019 (MLK Day) at 7pm. Billy is 12 years old, an avid drawer and aspiring comic book artist who comes home one day from school and suddenly, a box containing a Golden Pencil falls from the sky and anything he draws with it comes to life. Billy's universe becomes quickly wrapped up in a superhero world of possibility, newfound powers, bullies, and responsibility, but he has to learn the difference between drawing inside and outside of the lines. Read more. Art Beyond the Glass is a charity event series that celebrates the cocktail culture and artistic talents of local bartenders in each of the cities where it pops up. For the first time ever, Art Beyond the Glass is coming to New York City on Sunday, January 20, 2019 at Town Stages in Tribeca. Read more. Rafael Espinal, candidate for NYC Public Advocate, will be highlighting environmental issues and his commitment to supporting New York's nightlife and entertainment industries at a fundraiser party at Town Stages in Tribeca on Thursday, January 10, 2019 at 6:30pm. Special guests include acclaimed filmmaker and environmentalist Darren Aronofsky (mother!, Noah, Black Swan), environmental activist and sustainable business leader Lauren Singer, music by The Golden Pony (Elements Festival/BangOn!NYC), Penny Lane (Collective B.A.E. ), and Mira Farenheit, and performances by Nikki Ortiz, Tanya Karina, Dan Jones, and more! Read more. Town Stages announces a 90-Minute Wedding Contest! Town Stages announces a 90-Minute Wedding Giveaway Contest in partnership with Haute Dokimazo. Submissions will be accepted through December 20, 2018 at midnight, and a winner will be announced on December 27, 2018. The Wedding will take place on Monday, January 28, 2019 from 12:00pm-1:30pm. Read more. Town Stages presents That Must Be Fun, an evening of comedy to raise awareness for mental health, hosted by Audrey Stanfield on Friday, October 19, 2018 at 9:30pm at Town Stages, 221 West Broadway, NYC. The show features David Bluvband, Lindsay Calleran, Becky Chicoine, Catherine Cohen, Molly Gaebe, Michael Hartney, Aaron Jackson, Mike Kelton, Alison Leiby, X Mayo, Sam Reece, Connor Sampson, Brandon Scott Jones, Alex Song, Gianmarco Soresi, and more! Proceeds will be donated to Vibrant Emotional Health, NYC. Read more. Town Stages announces How to Raise a Self-Driven Child on Monday, September 24, 2018 at 6pm. How much control should you give your child over his or her own life? And at what age should you start? Hear William Stixrud, PhD and Ned Johnson, authors of the new and groundbreaking book "The Self-Driven Child," explain the science behind radically rethinking your role as a parent in order to foster your child's capacity for resilience, success and optimal development. Read more. “As artists, we spend nearly every waking hour of our lives in studios, on sets, in theatres, and in venues of all kinds,” said Sokoloff in a statement. “These are the places we convene and collaborate, grow, and transform. They are where we lift each other up, and where we make room for new voices and new perspectives. For many, these unique spaces are where we build our chosen families. In more ways than one, these cherished places are our homes.” Read more. Robin Sokoloff wears many hats: dancer, choreographer, lighting designer, construction worker, activist and producer are some of them. The founder and Executive Director of the artistic hub Loft227 recently signed a lease on a 9,000-square-foot storefront facility in Tribeca. 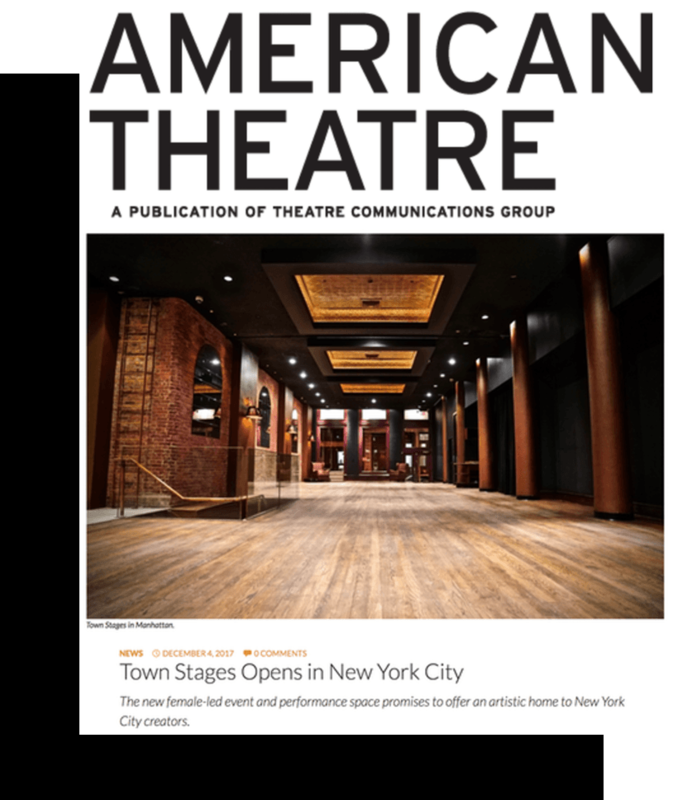 Located at 221 West Broadway, this space is now known as Town Stages, a new female-driven cultural institution and event venue that functions as a for-profit with a not-for-profit arm. Read more.